ðŸŒºðŸŒƒURBAN FAERIE KEI! A springtime offering for the Coffee + Thread 2017 Blog Tour! OHAYOU, everyone! How are you today?! Are you enjoying these first magical days of spring as much as we are?! There's just something about the cold, stoic earth turning the corner and slowly rejuvenating that just fills you with excitement, don't you agree?! I can't think of a better way to celebrate the season than with a new twirly dress! When Olga invited me to be a part of her fantastic blog tour, I was super giddy! 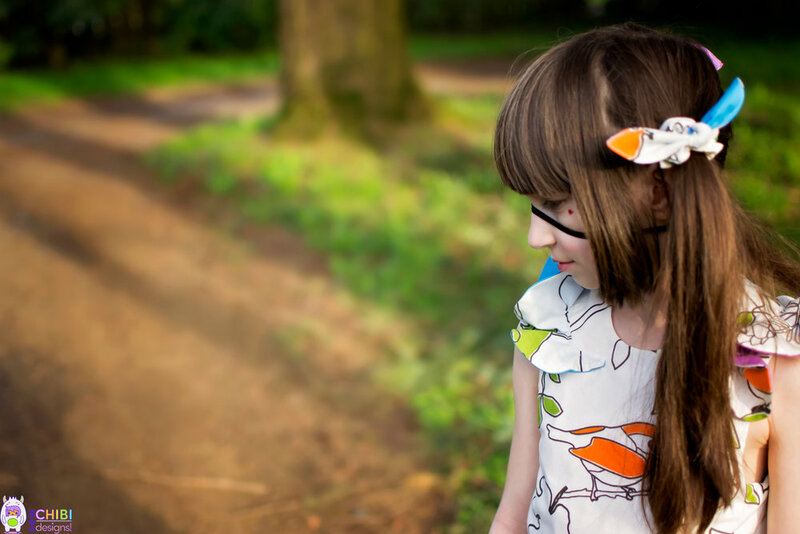 I've been smitten with the Polina Dress since I first saw it and when we went through all of the Coffee + Thread dress options, my little girl feel in looove with the Polina pattern as well! So, to tie the whole look together, I made a pair of Wild and Free Lounge Pants and a few, fun accessories, and the result was nothing short of magical! I always have to blend sizes when it comes to my eldest, so I made the size 5 width to the size 8 length which was perfect since she's almost exactly 128cm. We opted for the short frills and circle skirt (Option B, I think it was), and flared ties. The fit with the ties for the Polina was spot on: it adds a lovely shape without over-bunching so it never gaps or shifts. The look of the Polina fits in exactly with what I think of when I think of Coffee + Thread Patterns: classic details with a vintage silhouette. The frills look like little flower petals rolling off the shoulders! Doesn't she look like a little urban faerie?! The way she was prancing and twirling, so ethereal and full of innocence... it's how I how to always remember her at this age. That's why I called this the urban faerie kei outfit: just like the urban jungle, but faerie-style fashion! But, if you know me, you know I am prone to making rainbowsðŸŒˆ out of pretty much anything, so I made a few sneaky elements to make that happen: the underside of the frills and bows of the scrunchies are sky blue and purple. Ahhhh, muuuuuch better! I couldn't just stop at making the dress; I had to make it even more eye-catching! Since I went pretty subdued (ha! well for me) on the dress, I decided to make her accessories speak/sing/SCREAM! I made a pair of Wild + Free Lounge pants (and, ahem, this wasn't my first rodeo when it comes to those!) in a faded B + W with some color-blocked shin fronts (my girl loathes pink so I had to be careful in my color choices ðŸ˜†). I did attempt to take in the size 8 that I made at the out/inseams since she fell between three sizes: 5, 6 and 8. Seriously! It's a good thing I do sew for her all the time because everything I ever buy her in her size just hangs on her or is incredibly too short. Poor thing. Well, not so poor anymore since she got a brand new handmade dress! 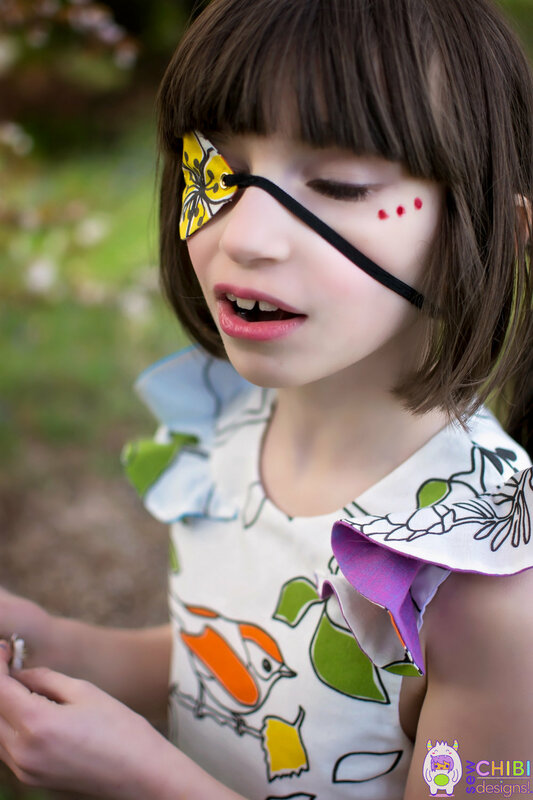 For an embarrassingly long time (years), I've yearned to make eyepatches an everyday accessory. Except, I never got around to making one for a project! 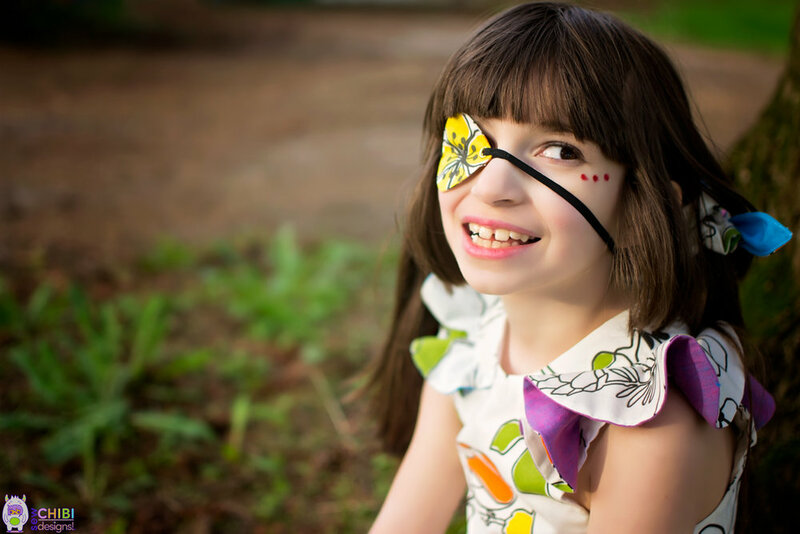 I hate that the only time kiddos wear eye-patches for photos are either for pirate costumes or function. I mean, they are sooooo cool! I see them all the time in a lot of the Japanese fashion trends and I just want to start the revolution here in the Western world too! So I made a little eyepatch from the same fabric, just strategically placed. And you better believe I'm going to be making many more since I have special plans for them. ðŸ˜ˆAll in due time, my pretties! Just make sure you're signed up for my newsletter to find out what I'm up to! The only other things I haven't mentioned are the scrunchies in her hair which I made from this Japanese Style Book of sewing patterns for kids! Who would have thought those would have made a come-back, am I right?! I'm sorta in love with them so don't be surprised if you see them again... and again.. and again! Vive 'eyepatch! So GEEZ, guys, there are so many more patterns that Olga makes that I didn't make that are just too cute as well! 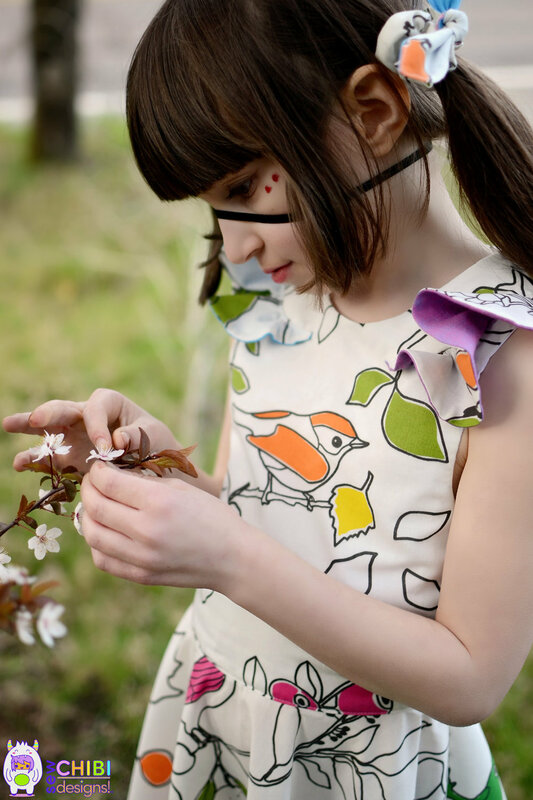 Do you remember the two first day of schools dresses I made using Olga's Elena Dress PDF Pattern? Here's a little refresher and click here to see the rest of that post! And there are sooo many fantastic people on this blog tour that you should DEFINITELY check out! Click here to see what the tour is all about! Have you ever thought, man, it would be so cool if Sew Chibi Designs got into designing patterns?! ðŸ˜± Because I have NEWS FOR YOU! But not quite yet (I know, I'm such a tease!) If you are into kiddo-sized Asian street fashion mixed in with a little bit of weirdness, then you are going to stay tuned for the release of my premiere sewing pattern, the ZOU playset, coming reeeeeeallly soon! [consequently, that is why it has been ultra quiet around here!] 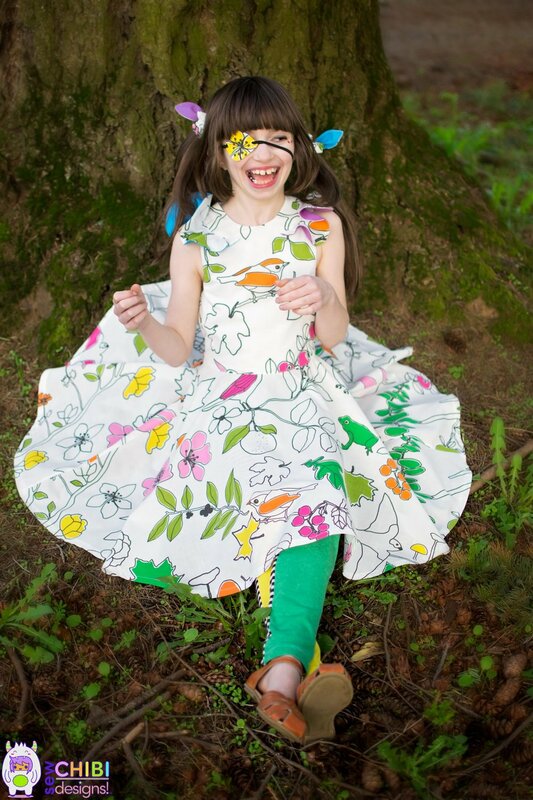 I am going to try to blow your mind with kawaii kids fashion pattern goodness so please hold on to your seats, okay?! P.S.) I am going to need testers in the next week or so, so if you are interested, send me an email and I'll send you the sign-up sheet!!! First time checking out Sew Chibi Designs? Maybe it's your first time since I redesigned everything?! If you just want even more: more explosively colorful and silly handmades or are really keen to making super cute stuff, you should sign up for my Sew Chibi Designs Newsletter which keeps you up to date with all the willy antics I'm up to PLUS exclusive access to my new SECRET FREEBIES CLUBHOUSE! created for sharing free patterns, updated content, printables, etc. You'll also be the first to know about new patterns, testing opportunities, and pattern discounts! Sign up with your email address to receive pattern news, updates, and exclusive access to the SECRET FREEBIE CLUBHOUSE!